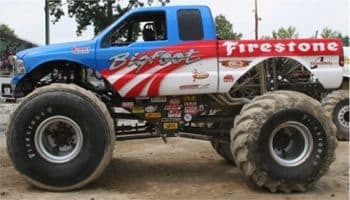 Bigfoot is the most iconic monster truck in the world. Construction began in 1975 and it was introduced in 1979. It was built from a 1974 Ford F-250 by Bob Chandler from Hazelwood, Missouri. In 1979, Chandler used his Bigfoot truck at various truck and tractor shows. It was originally built to help promote his store, Midwest Four Wheel Drive and Performance Center. In 1981, Chandler videotaped Bigfoot crushing two dilapidated cars. The video was shown in his store to help promote Bigfoot. A man organizing a motor-sports event in Columbia, Missouri saw the video and asked Chandler to bring Bigfoot to crush cars in front of a crowd. Chandler initially balked at the idea, not wanting to convey such a violent image. He eventually gave in, and in April of the following year, Bigfoot did its first pubic car crush. By the end of the year, a second Bigfoot was constructed to help meet the rising demand for the truck. Bigfoot 2 gained nationwide popularity when it crushed cars in Michigan at the Pontiac Silver Dome. This led to a sponsorship deal with Ford, which lasted from 1983 to 2005. By 1984, several competitor trucks emerged and many events began booking more than one truck. This gave birth to the car crushing competitions seen today, where two trucks crush cars side by side. Despite heavy competition, demand was still high for Chandler and his Bigfoot trucks. Many imitators had starting billing themselves as “World’s Biggest Truck.” Chandler bought a set of 10 foot tall tires and built Bigfoot 5 specifically for them. Bigfoot 5 stands at over 15 feet tall and is in the Guinness Book of World Records as the world’s tallest, widest, heaviest monster truck. Bigfoot’s demand continues today. Sponsorship deals with Microsoft, Firestone, DuPont and Summit Racing keep Bigfoot in the spotlight. Several Bigfoot trucks continue to race and compete in events worldwide. To date, over 20 Bigfoot trucks have been built, including several specialty monster trucks and trucks now in the hands of private owners. The original Bigfoot remained in competition until 1987. It now sits as a display and promotional truck outside of Bigfoot 4×4 in St. Louis, Missouri.